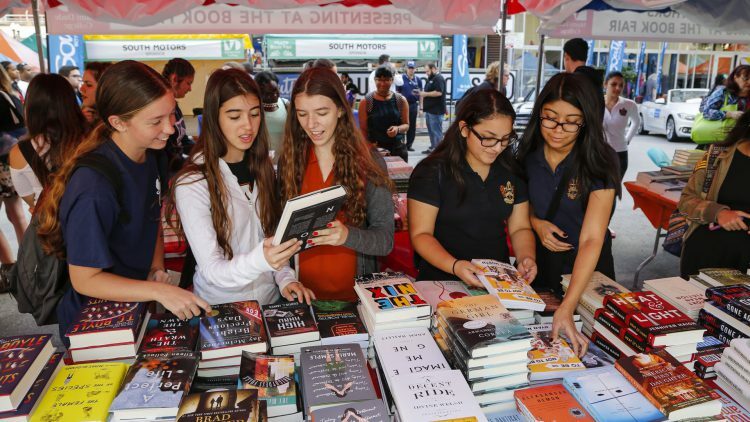 Miami Dade College’s acclaimed Miami Book Fair celebrates its 34th year at MDC’s Wolfson Campus in Downtown Miami, November 12 – 19. Isabel Allende, a fair favorite who has appeared at nearly every annual MBF, will present her latest novel, In the Midst of Winter on opening day. Check out other special events on opening day. Bring your kids and spend the day enjoying the beloved Children’s Alley. No need to wait in line at the entrance: Purchase your Street Fair tickets online. At the heart of the Fair is an inspiring selection of panels and presentations by 400-plus authors who write in English, Spanish and Creole. Among the notable authors are Walter Isaacson discussing Leonardo da Vinci; Salman Rushdie and his latest novel, The Golden House: A Novel; Michael Eric Dyson on Tears We Cannot Stop: A Sermon to White America; Lisa See on the Tea Girl of Hummingbird Lane; Jason Segal on Otherworld; Ambassador for Young People’s Literature, Gene Luen Yang discussing Reading Without Walls; Lauren Brook Eisen, on Inside Private Prisons: An American Dilemma in the Age of Mass Incarceration; and Patti Smith reading from Devotion (Why I Write). Comic book fans can geek out at this destination spot that features comic exhibitors, publishers, indie artists, and a brand-new Artists’ Cove booth where authors will be selling their wares, illustrating on-the-fly, and chatting with fans about all things comics. Destination: Comics kicks off with a special Drink and Draw event at The Standard Hotel and Spa on Thursday, Nov. 16, at 7 p.m. The event is free and open to the public and pits famed comics illustrators against each other in a battle to be crowned Drink and Draw champ! The drawing tables get turned and audience members then will have an opportunity to draw in teams and face-off against each other. At the weekend street fair, there will be panel discussions with comics and graphic novel creators, including Nate Powell, Mariko Tamaki, Mark Evanier, Trina Robbins, Jason Shiga, George O’Connor, Victor LaValle, Shannon Wheeler, to name a few. All taking place in the MAGIC screening Room (Bldg. 8, First Floor). Former Vice President Joe Biden shares the story of losing his son Beau in Promise Me, Dad: A Year of Hope, Hardship, and Purpose. Radio host Charlie Sykes speaks about How The Right Lost Its Mind. U.S. Senator Al Franken presents his memoir, Giant of the Senate. Ken Stern promotes Republican Like Me, How I Left the Liberal Bubble and Learned to Love the Right. Chris Matthews will speak about Bobby Kennedy: A Raging Spirit. Jenna Bush Hager and Barbara Pierce Bush present their book, Sisters First: Stories from Our Wild and Wonderful Life. News anchor Dan Rather presents his new book, What Unites Us. Lawrence O’Donnell, host of The Last Word on MSNBC talks about his life and politics. His book, Playing with Fire: The 1968 Election and the Transformation of American Politics is regarded as a master class in American electioneering. NBC broadcast journalist and MSNBC anchor, Katy Tur, presents her latest book, Unbelievable: My Front-Row Seat to the Craziest Campaign in American History. Sharyl Attkisson, the host of the weekly Sunday public affairs program, Full Measure with Sharyl Attkisson, presents her latest book, The Smear: How Shady Political Operatives and Fake News Control What You See, What You Think, and How You Vote. Activists Rev. Dr. William J. Barber II speaks about The Third Reconstruction: How a Moral Movement Is Overcoming the Politics of Division and Fear while Khizr Khan speaks about his new book, An American Family: A Memoir of Hope and Sacrifice. Miami Book Fair’s partnership with the National Book Awards continues with fiction nominees in attendance including Carmen Mari, on Her Body and Other Parties; Elliot Ackerman on Dark at the Crossing; Lisa Ko on The Leavers; Min Jin Lee on Pachinko; Margaret Wilkerson Sexton on A Kind of Freedom; and, Carol Zoreff on Barren Island. Nonfiction nominee attendees include Nancy MacLean on Democracy in Chains: The Deep History of the Radical Right’s Stealth Plan for America; Kevin Young on Bunk: The Rise of Hoaxes, Humbug, Plagiarists, Phonies, Post-Facts, and Fake News and Erica Armstrong Dunbar on Never Caught: The Washingtons’ Relentless Pursuit of their Runaway Slave, Ona Judge. The Young People’s Fiction Nominees include Robin Benway, Far From the Tree, Erika Sanchez on I am Not Your Perfect Mexican Daughter and Ibi Zoboi on American Street. Miami Book Fair again partners with Miami Culinary Institute MDC and Tuyo restaurant, with financial support from the Miami Downtown Development Authority, to create Kitchen Stadium, where chefs including Italian cooking legend Linda Bastianich share techniques, tricks and tips. Booking the Cooks brings well-known chefs together for a tasty evening of food and fundraising. The Miami Foundation joins Knight Foundation to fund The Porch, a multi-disciplinary performance and gathering space that features live music and off-beat literary activities and also functions as a “town square” for fairgoers. The quirky and eclectic programming ranges from poetry and food trucks to Drag Queen Bingo and the burlesque-inspired circus — Circ X.